What do I need in order to take the training with you? In order to take the Instructor Training Course, you need to meet the eligibility standards set out by ICBC. To be a class 5/7 (car) Instructor you must have a valid class 5 license for 3 years. To be a class 1 (truck) Instructor you must have a valid class 1 license for 3 years. To be a class 6/8 (motorcycle) Instructor you must have a valid class 6 license for 3 years. In addition, for all classes of licenses you must have a safe driving record, be willing to submit to a medical exam and criminal record check and not have any outstanding debts (tickets, bridge tolls, etc.) with ICBC. Please call ICBC at 1-800-950-1498 to begin the application process to determine if you are a suitable candidate. Once ICBC has provided written approval for you to take the Instructor Training Course, we would be happy to register you and start your training. What happens if I’m not approved by ICBC? Depending on the reasons ICBC has not approved you for Instructor training, you may be eligible to re-apply. Please contact ICBC at 1-800-950-1498 and they will be able to discuss and recommend a plan of action specific to your needs. How many tests are required during the Instructor training? ICBC requires an entrance quiz and on-road evaluation prior to the start of the course to ensure all potential Instructors are safe, confident and knowledgeable drivers. 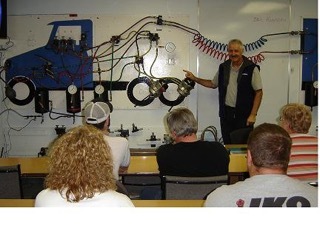 Depending on which Instructor Training Course (car, truck or motorcycle) you plan to attend, there can be various quizzes throughout the course as well as a written final exam and on-road practical assessments. But don’t worry, during the course you will receive all the necessary information and training to help you be successful! I would like to be a Truck Instructor, what does that require? You must possess a valid class 1 license for a minimum of 3 years in order to be eligible to become a truck Instructor. In addition, you must have a safe driving record, be willing to submit to a medical exam and criminal record check and not have any outstanding debts (tickets, bridge tolls, etc) with ICBC. The training to become a class 1 (truck) Instructor ICBC requires completion of the class 5/7 (car) Instructor training course, followed by the class 1 (truck) Instructor training course. In-class and on-road training in the car, followed by in-class, on-road and pre-trip training in the truck would be provided. Do I have to take the Car Instructor Course if I plan to be a Class 6/8 Instructor? In order to be a class 6/8 (motorcycle) Instructor you would need to take the class 6/8 motorcycle Instructor course. You do not have to take the class 5/7 (car) Instructor course in order to be a class 6/8 (motorcycle) instructor. You will be required to possess a valid class 6 license for a minimum of 3 years in order to be eligible to become a motorcycle instructor. In addition, you must have a safe driving record, be willing to submit to a medical exam and criminal record check and not have any outstanding debts (tickets, bridge tolls, etc) with ICBC. What kind of hours does an Instructor work? Many factors such as student needs, time of year and location can affect the hours of an Instructor. If you are interested in an Instructor position with us, please feel free to call us at 604-856-0115 to arrange an interview and learn more about the benefits joining our team. How much do Instructors EARN per hour? Many factors can affect the hourly rate of an Instructor. Driving School hourly pay rates can vary due to services, type of training offered, employee experience and location. Owner/operators will have to factor in the costs associated with owning their own school such as insurance, fuel, advertising, etc. As an Instructor do I get a company car? Every Driving School will have their own best practices and benefits when it comes to use of company vehicles. If you are interested in an Instructor position with us, please feel free to call us at 604-856-0115 to arrange an interview and learn more about the benefits of joining our team. What do the schedules for training look like? Training schedules vary. The course will take place during the daytime, evening & weekend hours – much like your work schedule once you are an Instructor. Click here to view our course calendar. The majority of the classes are held at our Career Centre located at 27078 56th Avenue in Langley. As part of the course you will be required to visit some of our other offices to be part of active training with some of our current students. All our course dates and times are listed here. Do you offer financing for Instructor training? Yes! INTEREST FREE payment plans are spread out over the term of your training. If you wish, you may pre-pay for your package and should you decide that you will not require the entire package, we will only charge you for the training you received and we will refund the balance. Students may receive funding through various sources such as WorkBC, Worksafe, RRSPs, & RESPs. If you are looking at another source for funding, you are more than welcome to attend any of our offices to receive a personalized Acceptance Letter and a packet of information. If you are looking at another company for funding, you are more than welcome to attend any of our offices to receive a personalized Acceptance Letter and a packet of information.